We wake up every day to make breakfast, brew our coffee, and get ready for the workday. Every week we go to our jobs and we see the same people. We form bonds and we consider these coworkers our work family. We celebrate births and we celebrate retirements. One person’s achievement becomes good news for all. For the people of Thatcher Glass, those bonds were unbreakable, and the transition from the workday to their home lives was seamless. 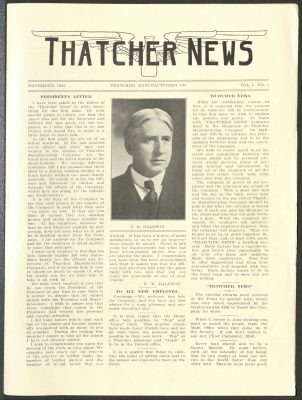 While cataloging this collection, I came upon a series of newsletters entitled Thatcher News. It was published every month and was full of stories, reports, jokes, updates from the employees, etc. When I read the first issue, I considered Thatcher News like any other employee newsletter. But I was wrong, and that was made clear by the time I had finished reading the first few issues. In each issue, we learn about the daily lives of these “Thatcherites” and their families. There were birth announcements and announcements of beloved workers leaving for other opportunities outside Thatcher. Occasionally there was mourning for the passing of a longtime Thatcherite, met with heartfelt words and their picture in that issue. Updates on Thatcherite children were common, along with family photos. Many times new workers were welcomed with their family’s portrait being featured in the newsletter along with a congratulations on the new job. 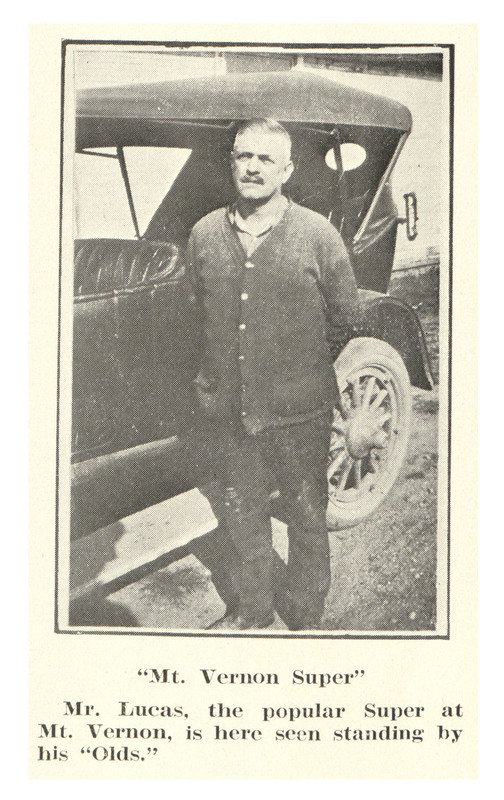 New employee Jake Roller, from the May 1922 issue of Thatcher News. A family portrait from the October 1921 issue of Thatcher News. I also learned some interesting tidbits of information while perusing the newsletters. Did you know that the plant in Elmira had a baseball team? Neither did I! Baseball was taken very seriously, with team officers being elected every season. Elmira plant baseball team officers. From Thatcher News, May 1922. 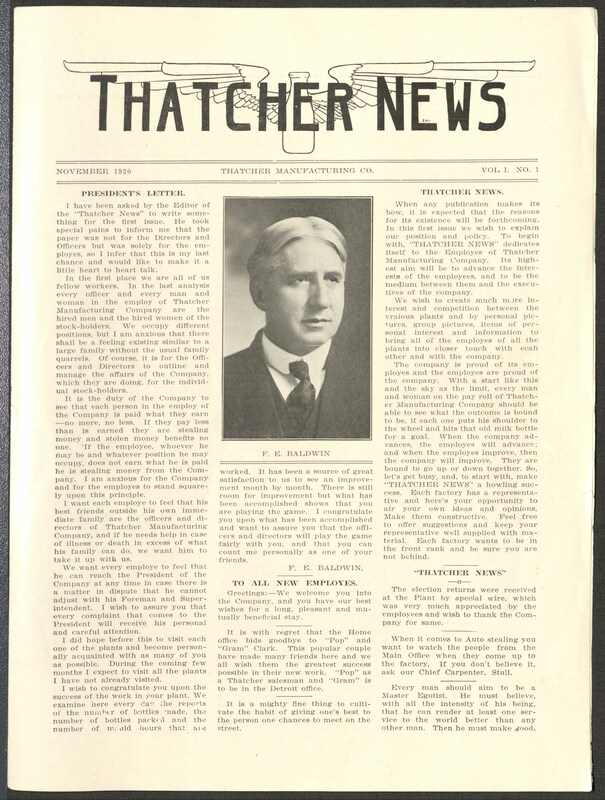 Thatcher baseball team manager, Thatcher News, April 1921. Catch of the day! From Thatcher News, October 1921. 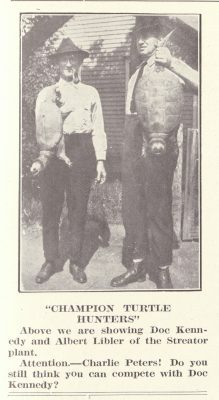 We also can’t forget about the champion turtle hunters from the Streator, Ill., plant! 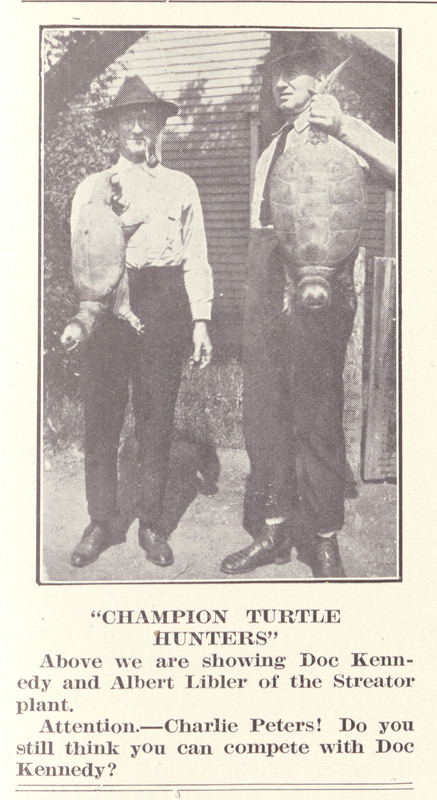 Champion turtle hunters from the June 1922 issue of Thatcher News. Mr. Lucas shows off his car in a January 1922 issue of Thatcher News. Find more images of Thatcherites on our social media channels! Tagged: Archives, Chemung County Historical Society, Christina Baker, Elmira, Library, library collection, milk bottles, newsletter, SCRLC, Thatcher Glass Manufacturing Co.